Heat oven to 450°F. Make pudding as directed on box for pie filling. Cover with plastic wrap; refrigerate. Unroll pie crust onto work surface. Using rolling pin, roll out pie crust into 12-inch round. Using 2 1/2-inch round cookie cutter, cut 24 rounds from pie crust, rerolling scraps if needed. Press 1 pastry round into each of 24 ungreased mini muffin cups. Spoon 1 teaspoon of the dulce de leche (reserve 2 tablespoons) in each cup. Bake 4 to 7 minutes or until light golden brown. Cool in pan 2 minutes; remove from pan to cooling rack. Cool completely, about 30 minutes. Spoon 1 teaspoon pudding (refrigerate remaining pudding for another use) onto dulce de leche in each cup. Top each with 1 banana slice and 1 teaspoon whipped cream. In small microwavable bowl, microwave reserved 2 tablespoons dulce de leche uncovered on High 10 to 20 seconds or until smooth. Spoon into 1-quart resealable food-storage plastic bag. Cut 1/4-inch opening from 1 corner of bag. 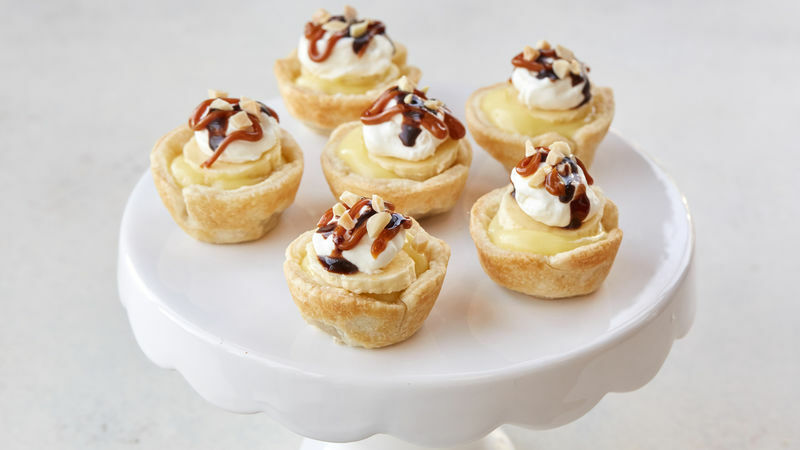 Drizzle cups with dulce de leche and chocolate syrup. Sprinkle with toasted almonds. For a fun twist, sprinkle tarts with toffee bits and almonds. To toast almonds, spread almonds on ungreased cookie sheet. Bake at 350°F 8 to 10 minutes, stirring occasionally, until golden brown.